Pop quiz: name the six architects that were most influential in defining Desert Modernism during the 1930s, 40s and 50s. Stumped? So was I until I took the Essential Palm Springs Tour, a 90-minute ride along showcasing the works of William Cody, Albert Frey, Hugh Kaptur, William Krisel, Donald Wexler and E. Stewart Williams. 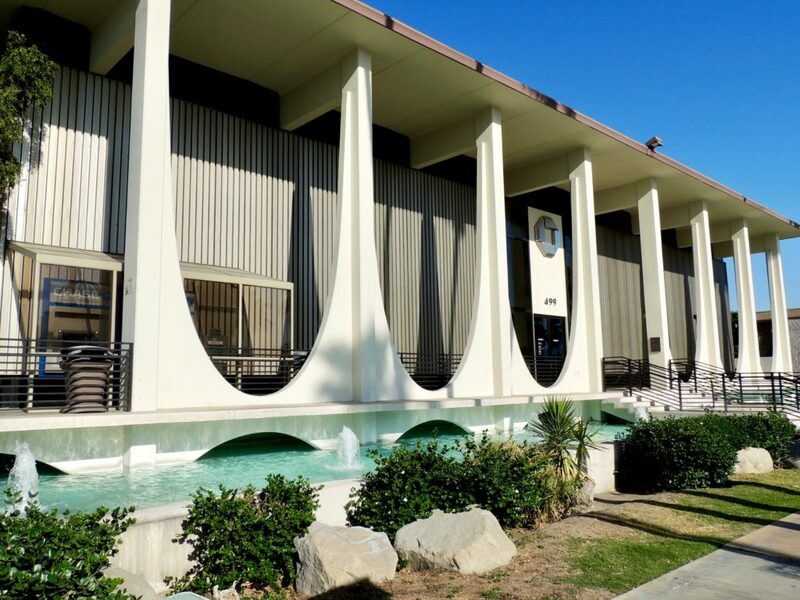 Curated by longtime local designer and mid-century modern aficionado, Kurt Cyr, the tour shared insights into the mid-century modern movement in this Southern California city, and how the legacy of these architects is evident decades later in many homes and commercial structures. 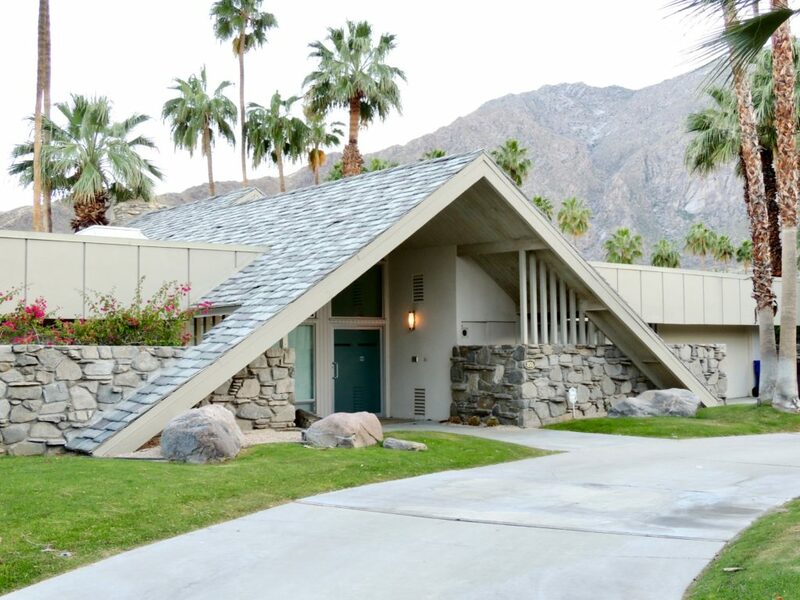 Of the five of us occupying Kurt’s air-conditioned Honda minivan, none were architects, but we each had a fascination for the designs and architectural innovations spawned at the foot of the San Jacinto Mountains. Ten minutes into the tour we were given a basic vocabulary to better appreciate how these architects could balance the artistic ‘yin’ and construction ‘yang’ enabling them to create such glass-centric and compelling, yet desert-resilient residences and buildings. The first was cantilever, the unsupported roof section that extends out beyond the building’s envelope. Next was clerestory windows, the ones right below the roof line, followed by brise-soleil. French for break or shatter, brise, when combined with soleil (sun in French) is a sun screening device. Then came butterfly roofs, an inversion of the standard roof design resulting in a ‘V’ shape, and spider leg, an effect of having a long horizontal beam converge with a vertical post at the edge of a home. Lastly was solid wall, a tactic that allowed a structure using a significant amount of glass to remain rigid so the place wouldn’t torque, twist and collapse. On our ride, we traveled north, south, east and west through classic neighborhoods including Racquet Club West, The Movie Colony, Historic Tennis Club, Old Las Palmas and Sunmor Estates. Cyr was virtually encyclopedic in what he told us about traits associated with each architect (e.g. William Cody was known as the ‘King of Thin’ for using wafer thin roof lines and slender columns), and he was also well versed in the history of homes owned by entertainment luminaries including Rat Packers Frank Sinatra, Dean Martin and Peter Lawford, and Old Hollywood royalty like Marilyn Monroe, Cary Grant, John Wayne, Marlene Dietrich, Darrell Zanuck, Bob Hope, Carol Lombard, Clark Gable and Elizabeth Taylor. Cruising the south side of town, we happened on several cul-du-sacs influenced by the ‘tiki-mania’ that resulted from Hawaii becoming the 50th state in 1959. After perusing various residential neighborhoods, Cyr shifted our attention to notable commercial buildings, including what was once a Shell gas station built in the 1960s that showcased Cody’s super thin, cantilevered roof, what was the City National Bank designed by Victor Gruen and Associates in the late 50s (now Bank of America), the fire station, designed by Albert Frey in 1955 and another Frey design, the Tramway Gas Station built in 1965 that today is the Palm Springs Visitor Center. 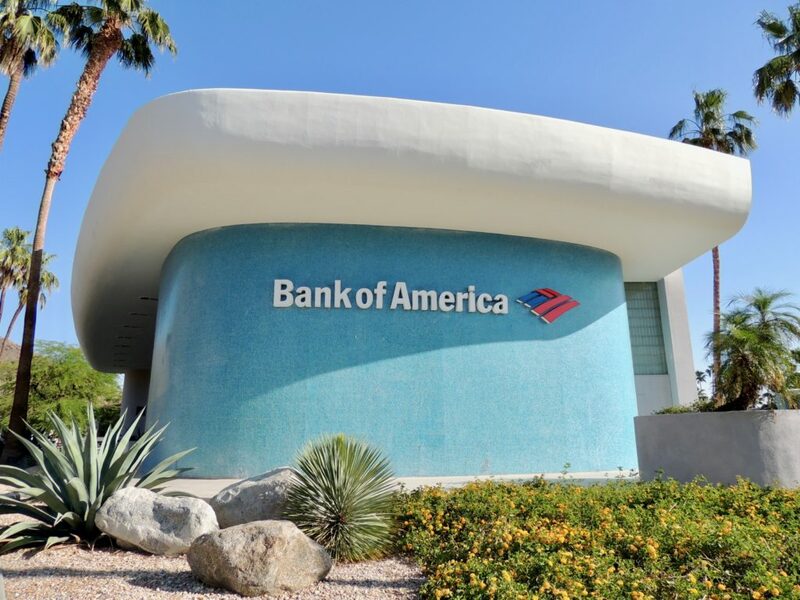 To see how well the Desert Modernism of the 1940s holds up today, check out the KFC on South Palm Canyon Drive and the Palm Springs Animal Shelter, a pair of structures by contemporary architect James Cioffi. Apparent throughout the tour, aside from Cyr’s acuity for all things architectural in Palm Springs, was his passion for preservation. 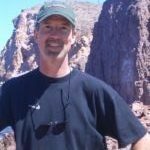 For every home and commercial structure he pointed out to us, he had stories to share about notable places being razed and history being lost to the wrecking ball. We were pleased to learn that not only do designated historic sites and districts exist, there is also a Historic Site Preservation Board, the Palm Springs Preservation Foundation and the Palm Springs Historical Society that offers informative walking tours. There are several options for architectural tours. Kurt Cyr’s tour company Palm Springs Mod Squad offers The Interiors Tour (cost $125), The Essential Palm Springs Tour (cost $65), Martinis & Mid-Century Architecture (cost $75), and The Tiki Tour (cost $75). All tours run about 90 minutes. 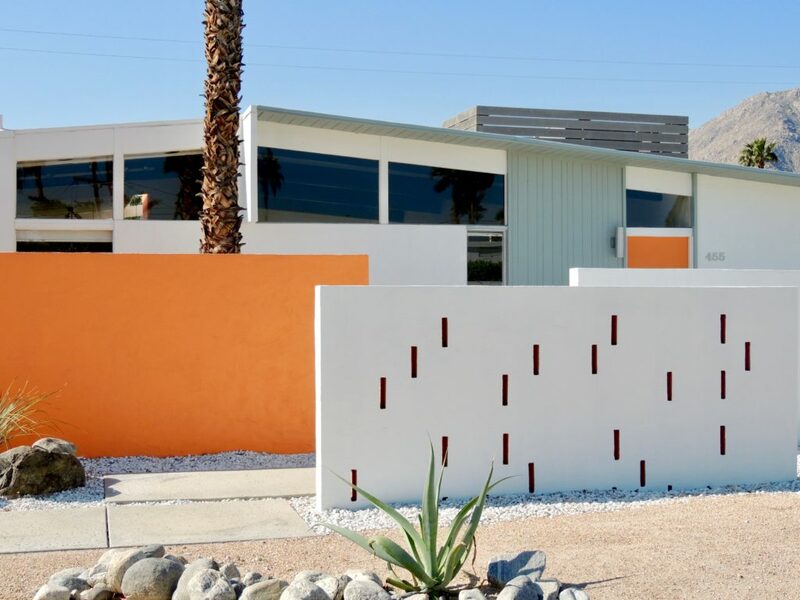 Robert Imber’s Palm Springs Modern Tours invites groups of six or fewer to learn more about ‘Desert Modernism’, sharing info on distinctive homes, celeb hideaways, familiar film locations and preserved commercial buildings. Tours run around three hours; cost is $95 per person. Led by Trevor O’Donnell, guests of PS Architecture Tours are introduced to the homes, buildings and backstories on each during an approximately three-hour tour. Cost is $85 per guest and PSAT accommodates up to five people per tour (a customized tour for up to six starts at $425 per tour). Guided by Michael Stern, guests of The Modern Tour enjoy an interiors/exteriors tour lasting around 2.5 hours. Tours of up to six guests see the interiors of some of the city’s most fabulous homes. Cost: $150 per person. With any tour it is key you make a reservation in advance if you’re planning a winter visit and especially during Modernism Week (February 15 – 25, 2018). Fall Preview is October 19 – 22, 2017. 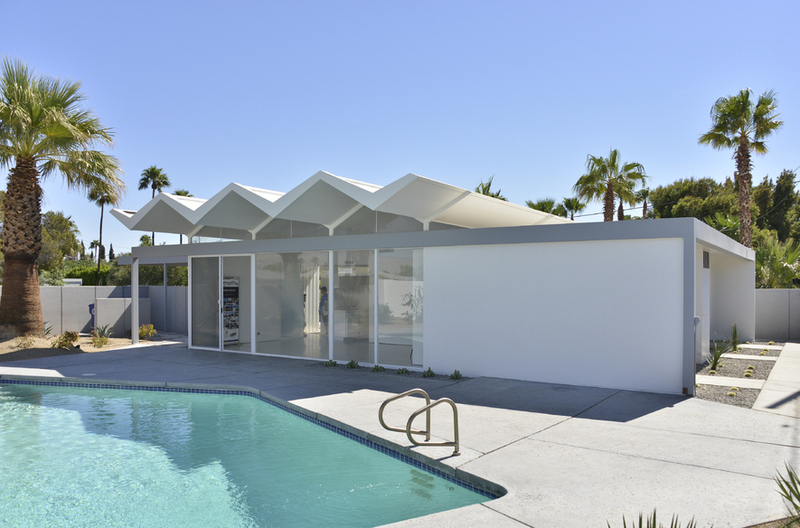 A nifty app—Palm Springs Modern—gives viewers cool virtual tours of many iconic mid-century properties. Great photos and story. Now I want to see it all in person!